This collaborative effort is an ongoing project started by myself and Stephanie of Mommy, For Real. We will be sharing essays on women’s friendship, both our own, and hopefully some of yours! Read on to learn more about this series and how you can submit an essay. To read the essays and to read more about the HerStories Project, please visit our HerStories Project site. 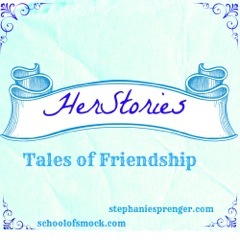 How HerStories: Tales of Friendship was born. My friend Stephanie of Mommy, For Real recently told me about a remarkable book, She Matters: A Life in Friendships by Susanna Sonneberg. (You can read the New York Times book review here.) For both of us, this book ignited a spark. As we devoured each story in the book, we found ourselves imagining, if I were writing a book about the friendships that were formative in my life, who would I write about? After reading it, neither of us could stop thinking about the book, and reflecting on our childhoods, college years, and adult lives, and the women who were instrumental in shaping us during these years. Very soon, an idea was born…. Female friendship is an extremely rich and complex topic. From the childhood friend who broke your heart to the college roommate who witnessed you at your highest (literally?) and lowest, from the lost friendship that ended bitterly to the devoted companion who is still in your life, from the bond that was forged due to shared grief to the shaky connection born with new motherhood, we would like to explore as many layers of friendship as we can. We want to hear about the friends that have been influential in your lives. The bonds of female friendship are complex. Female friendships are everything at the same: they’re supportive enough to sustain the worst that life has to offer; they can inflict misery, pain and judgment enough to feel the wounds decades later; they can include more kindness and generosity of spirit than almost any other bond. Any girl or woman can describe how a friend is capable of both crushing a person’s spirit as well as nurturing the best parts of herself. This is the paradox of female friendship: experiences of intimacy, love, and support, as well as heart break and deep wounds. Tell us about a friend that mattered to you. Show us why, through your story, whether it is light-hearted, gut-wrenching or somewhere in between. And read other women’s stories of friendship, and tell us why you can relate to them, or not. We can’t wait to hear your stories! Please contact us at herstoriesfriendshiptales@gmail.com with any questions or ideas you may have. Share your HerStory with us by sending us a story with approximately 500-1000 words as well as a 2-3 sentence bio.